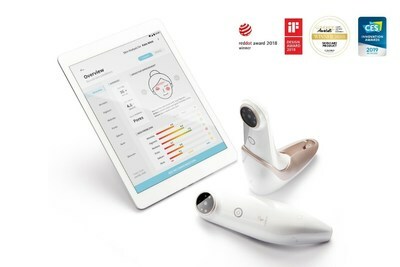 DUBAI, United Arab Emirates, April 15, 2019 /PRNewswire/ -- The AI beauty startup, lululab, will be launching its AI skincare assistant "LUMINI" at Beautyworld Middle East, the largest beauty expo in the Middle East, which will be held in Dubai from April 15 to 17 (Booth: C2A08). lululab, a spin-off company of C-Lab, Samsung Electronics' in-house venture program and a member company of the Born2Global Centre, has developed the LUMINI, an AI-based skincare assistant that provides customers with individually tailored skincare solutions. lululab is already being recognized in the beauty industry. The company received the Innovation Award at CES 2019 and was named the winner of the skincare category at Cosmoprof Asia 2018. The LUMINI offers a three-step service (face scanning, skin analysis, and product recommendation) using AI technology independently developed by lululab. It is comprised of a small device that scans the face of the user and a mobile application that shows the user the analysis results and suggests customized solutions. Based on AI technology, it scans and analyzes the condition of a person's skin within 10 seconds. Using the results of this diagnosis, the LUMINI is then able to recommend the cosmetic products that can best meet the individual's skincare needs. At Beautyworld Middle East, lululab will host a K-beauty product recommending event for visitors to the company's booth. lululab CEO Yongjoon Choe said, "By applying the LUMINI to the global beauty industry, we hope to offer customers who visit makeup stores, shopping malls, spas, and other beauty-related facilities accurate skin analyses and individually-tailored services that can be used anytime, anyplace. Today's consumers are smart; they do their research online and they are the final decision makers. We give them the digital tool to strengthen their confidence and ease their final decision on what products to buy. Through continued collaborations with beauty companies and companies representing diverse sectors, including distribution and IT, we hope to provide individualized IT services that can be easily used by as many people as possible." Based on this year's product launch, lululab aims to increase exports and strengthen ties with K-beauty brands in the Middle Eastern beauty market.